USB Input / Output Board is a spectacular little development board / parallel port replacement featuring PIC18F2455 / PIC18F2550 microcontroller. USB IO Board is compatibile with Windows / Mac OSX / Linux computers. When attached to Windows IO board will show up as RS232 COM port. You can control 16 individual microcontroller I/O pins by sending simple serial commands. USB Input / Output Board is self-powered by USB port and can provide up to 500mA for electronic projects. USB IO Board is breadboard compatible. Simply solder included 12-PIN & 8-PIN headers on the bottom side of the PCB and the board can be plugged into a breadboard for quick prototyping. Control LEDs, toys, electronic gadgets, wireless control, etc. 5-PIN header on the left is an ICSP connector (In Circuit Serial Programming) for downloading future firmware releases. Download USB IO Board drivers and unzip it. 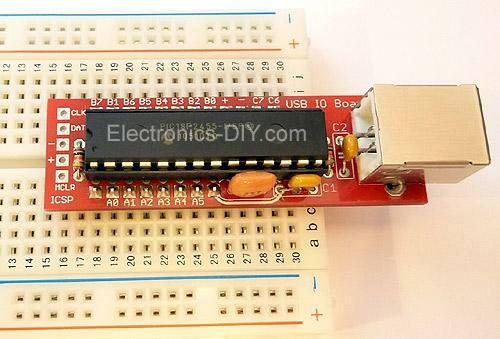 2) Connect USB IO Board to a computer using standard USB cable. 3) Windows will ask you if you want to install a driver. Point it to drivers you unzipped. Under Windows 2000 or XP you will be prompted twice to install two drivers. On the first prompt please browse and point to MCHPUSB driver folder. On the second prompt please browse and point to USB CDC driver folder. Under Windows 7 or VISTA you might be only prompted once to install USB CDC driver if MCHPUSB driver is already installed. 4) After the drivers are installed go to the Device Manager (right click on My Computer and click Properties->Hardware->Device Manager), and look under the Ports (COM & LPT) section, and you should see a new serial port there. Note the COM port number. 5) Open up your favorite serial emulator; the really awful HyperTerminal that comes with Windows, or my personal favorite USB IO Board Controller which can be downloaded here. 6) After launching USB IO Board Controller select the COM port from the drop-down list to connect to the board, type “V” in the input box and hit Enter or click on “Send” button. You should get back a firmware version number from PIC18F2455 / PIC18F2550 chip. This proves that USB IO Board is working properly. 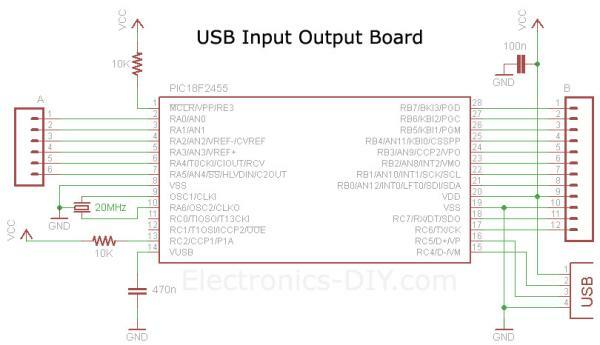 Now you are ready to learn about the commands that can be used to control USB IO Board. USB IO Board can be controlled with just about any serial port emulation program such as Hyper Terminal that comes with every Windows OS. The problem with Hyper Terminal is that you can’t see the commands as you type them and that could be very annoying. With Hyper Terminal you also have to go through the wizard for setting up a serial port connection, and if the COM port changes you pretty much have to do it over and over again. Luckily we have released our own little application called USB IO Board Controller that is so much easier and fun to use than Hyper Terminal. It only takes 25KB of space so it’s very lightweight. USB IO Board Controller will also show you COM port of USB IO Board so that will save you the trip (and time) to Device Manager to find out USB IO Board COM port number. To use USB IO Board Controller select the COM port from the drop down list, type the command and hit “Enter” key (or click on Send button). Each command returns “OK” message to acknowlege that the command was received and processed successfully. Below you will find USB IO Board Controller source code written in C# and Visual Basic .NET using free Visual Studio 2008 Express IDE software. Use it as a foundation to get started on any projects of your choice. The code demonstrates how to list COM ports, connect to COM port, send commands and receive data from USB IO Board. // Copyright www.Electronics-DIY.com © 2002-2012. All Rights Reserved.
' Copyright www.Electronics-DIY.com © 2002-2012. All Rights Reserved. StatusBar.Text = "Select COM port"
Lets run some sample commands to see how easy it is to turn LED ON/OFF. Here’s an example on how we can measure voltage on PIN2 (AN0) and still be able to use other ports as outputs. Maximum input voltage of PIC18F2455 / PIC18F2550 microcontroller is limited to 5V but with a simple two resistor voltage divider we can easily measure up to any voltage we want. Use 1K resistor connected to PIN2 and GND and 100K resistor connected to PIN2 and input to measure up to 500V. Please see USB Voltmeter page for more information. USB IO Board will return digital representation of voltage and display it on the computer. Please read more about “C” command below on how to configure more analog inputs. You can string together as many commands as you want into one string, and then send that string all at once to the USB IO Board. As long as each individual command is not more than 64 bytes, this will work well. By putting many commands together (each with their own terminating <CR>) and sending it all to the USB IO Board at once, you make the most efficient use of the USB bandwidth. After successful reception of a command, the USB IO Board will always send back an OK packet, which will consist of “OK<CR><LF>”. For just testing things out with a terminal emulator, this is very useful because it tells you that the USB IO Board understood your command. However, it does add extra communications overhead that may not be appreciated in a higher speed application. Starting with this version (1.4.0) you can use the CU command to turn off the sending of “OK” packets. Errors will still be sent, but not any “OK” packets. Currently, the backspace key does not work. For example, if you are typing a command to the USB IO Board from a terminal emulator and you make a mistake and try to backspace to correct your mistake, the USB IO Board will not recognize the backspace and will generate an error. This will hopefully be correct in a future FW D version. All command names (“C”, “BC”, etc.) are case insensitive.